Claremont Senior Living is an excellent facility. It's very well laid out and clean. The people running it are very nice. It looks like a very good possibility should we get to the point where we need it. I like the dining setup. It looks like they had a wide variety of both in-house and outside activities and trips, games, music and memory games for those who need them. I wasn't very impressed with Claremont Senior Living during my tour. It was dark and dingy, and the people who were living there were more infirm. It has more of a hospital atmosphere and it was more expensive for my brother than the other place I went to. I didn't see many of the residents out and about, and the building wasn't very bright and didnt have a lot of windows. I saw the dining area and the rooms, but the rooms were very small. It seemed like the older folks are going there to die and not to live. But the staff members that I did talk to were amazing. The best way to get to know a community is by scheduling a tour. See the facilities, meet the staff and residents, and get a feel first hand what it's like to live at Claremont Senior Living Assisted Living. Thanks to our remodel in 2013, Claremont Senior Living provides an even more inspired lifestyle for loved ones who require assisted living services or memory care. From our welcoming lobbies to colorful courtyards, we haven't overlooked any detail in providing our residents a home like no other. And with plentiful restaurants, parks and shopping opportunities nearby, Bremerton is the perfect setting for active seniors. Claremont Senior Living is one of many retirement communities owned by the Senior Lifestyle Corporation. We pride ourselves on creating senior living communities that enable seniors to live healthy and fulfilling lives, and our Wellness Everyday program offered at every community is praised by the International Council on Active Aging. Our residents are pleasantly surprised when joining our community to learn that they retain their independence: they choose the activities that fill their days and we are here to support that decision. Whether that means providing transportation to the nearby Bremerton Senior Center for an event or arranging a game night, we strive to accommodate any request. We also take pride in the apartments that our residents call home. Our studio and one-bedroom floor plans feature all the conveniences of a home with the security of 24-hour staffing. Because we handle the responsibilities of housekeeping and laundry, your loved one is free for to pursue more fulfilling activities. Mealtime at Claremont Senior Living is always looked forward to, thanks to our talented culinary team that produces delicious meals using locally sourced ingredients. Residents gather in the community dining room which features restaurant-style dining. The room also plays host to holiday parties, while on summer days, the courtyard hosts barbeques. While residents appreciate their independence, families rest easy knowing our qualified staff delivers compassionate, supportive care. Whether it is assistance with activities of daily living or specialized Alzheimer's or dementia care, we have the resources to accommodate your loved one's care needs. For each resident we craft an Individual Service Plan that outlines the care we will deliver, and it is updated when a change is observed. 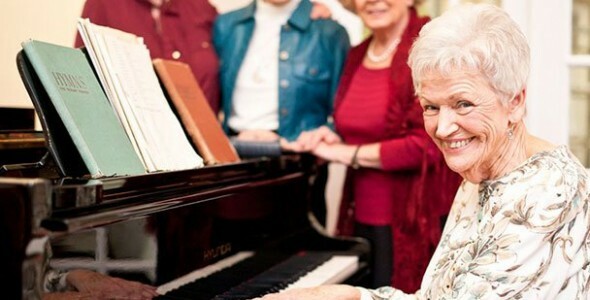 Claremont Senior Living is a community where not only is there plenty to do, but where friends become family.